The new AANP.org homepage and a second-level page dedicated to NP Education. And they do all of this while remaining focused on the whole person, guiding patients and their families to live healthy lifestyles. Thanks in large part to the tireless commitment of AANP—which creates products, services, and tools that empower NPs to deliver the high-quality care that patients deserve—the NP role has become integral to the American health care system. Our clients partner with us because of pain. The particular pain they’re feeling—e.g., a website that looks terrible on cell phones, drooping metrics in Google Analytics, an outdated identity, etc.—finally becomes too acute to ignore. They go looking for a cure, and we’re here to help. AANP’s particular pain was content abundance. As an enormous organization that is advocating for NPs on countless fronts, AANP has a lot to say. They generate and curate news every day. It’s a lot to govern. Over the years, the old website had grown bloated and ineffective. It simply wasn’t designed to handle everything that AANP does. Mobile responsive views of the AANP website. Yes, AANP needed a new website. Yes, their content was valuable to their members. Yes, AANP needed a modern look, a mobile-friendly experience, and a sophisticated CMS running the back-end. But more than anything, AANP needed expert advice on how to make sense of their content. This meant helping them think about how to organize their many messages, deliverables, services, events, and news on a single website—while still ensuring that the site’s main purpose was to attract more members. It was a taxonomic challenge, exactly the kind we love to tackle. AANP’s mission is to empower all NPs to advance health care through practice, education, advocacy, research and leadership. 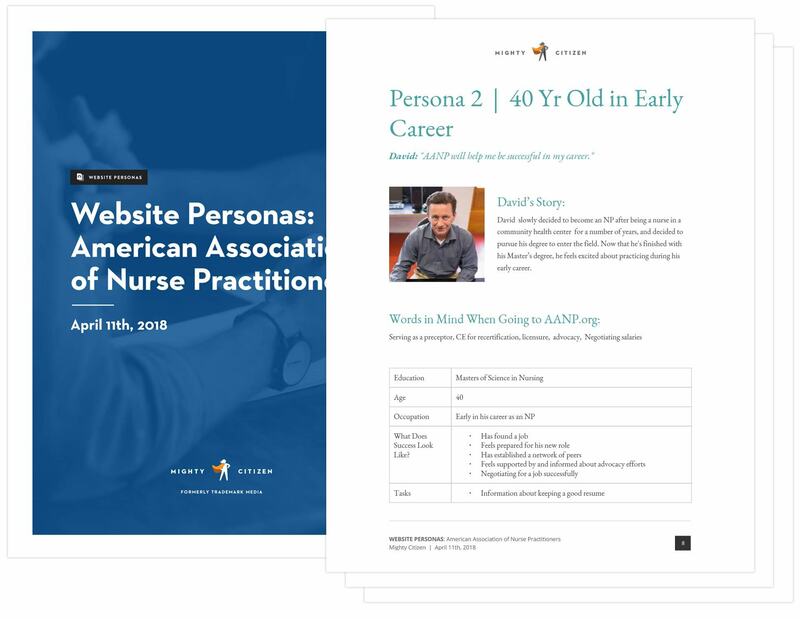 Through the use of focus groups, audience surveys, and Google Analytics, we identified that AANP’s website traffic focused on three primary service pillars—Education, Practice, and Advocacy. With that structure in mind, we were able to categorize, restructure, and redesign the interface to streamline the user experience. For most projects, we’ll conduct at least two, half-day Discovery Sessions, during which we ask a ton of specific questions. But given the scope of AANP’s vision, we conducted five sessions—including one focused on design and messaging, one on technology, two on user experience, and one a general info-gathering workshop. We conducted six stakeholder interviews with key figures within and outside of AANP. Plenty of insights were uncovered—including recommendations for how to structure website content, visual design preferences, and how to speak to particular audiences. We conducted three focus groups. One for each: NP students, long-term members, and new members. What drove them to join AANP, really? What do they want from their association and its website? For example, we learned during the focus groups that AANP’s advocacy efforts are highly respected and that users would love to learn more about the association’s legislative efforts. That had an instant impact on how those sections of the site would be structured. Personas are concrete representations of each of your audiences that assures you remain laser-focused on serving their needs. Pulling from our research, we created five personas for AANP—including representations of rural-based NPs, urban-based NPs, students in NP school, etc. Once we knew all of this, our directive was clear: Give AANP a messaging platform, content governance structure, and website that expands their influence among both current members and prospective members. On this project, the public wasn’t our audience; NPs themselves were. Everything should aim at serving, delighting, and interacting with NPs and potential NPs. To do this, we worked closely with AANP to compose a Messaging Platform. Every association needs to make a choice: Is their website meant to (a) recruit new members or (b) keep current members engaged? When we ask this question to our association clients, their first (understandable) response is: “We want our website to do both of those things.” But we push them to prioritize one over the other because attempting to speak to two very different audiences in the same space doesn’t work. It dilutes the message and leads to user confusion. AANP’s membership count is currently hovering around 95,000. But there are another 175,000+ practicing NPs who haven’t joined. With that in mind, together we decided that the thrust of the new website would be membership recruitment. The hero section of the new AANP homepage. The moment an NP lands on her association’s homepage, she should be instantly reminded of why any of this matters. She should feel a shock of pride—in her profession, in what she has chosen to do with her career. She should feel a part of something big and important. The new homepage features high-res photos of real NPs, with a new picture appearing every time the page is reloaded. The hero message reads: “Empowering NPs Nationwide.” It’s a simple, straightforward message that’s impossible to misinterpret. AANP is in their corner. For this phase, we were designing and building the public-facing website. But we had to ensure that both sites interacted fluently and securely because the member experience needed to be seamless. Lock icons were added to site content, indicating member-only access. But what about NPs who visited the website while logged in to their AANP account? For them, AANP.org needed to blossom—to un-gate all of its gated content. This seems easy from the user’s point of view: There’s a logged-in experience and a logged-out experience. But on the back end, our development squad had to execute some binary magic. That second website—my.AANP.org—is what determines a visitor’s logged-in status. We built a bridge between the two so that, if a user was logged in to my.AANP.org, the main website knew to make everything available. It goes a step further: The site integration allows the AANP web team to manage which content is displayed based on specific criteria. For example, if a user is logged in with the “student membership,” certain content that’s meant only for the “NP membership (non-student)” type would remain hidden/gated. We’ll spare you a deep dive into how we accomplished all of this. But the system integration is seamless and unnoticeable, thanks in large part to the collaboration of AANP’s technologists. AANP’s filterable news listing layout. Professional associations are primarily news and events organizations. They make and share news, and they create experiences that help their members thrive. So their websites need to do an excellent job at clearly communicating the two. For AANP, we used AJAX to handle news and events. AJAX is a way of coding a website that allows content to update seamlessly without needing to reload a page. Now, when users filter the long list of AANP Events, the filtered results display instantly. It’s a small touch that has an immense impact on the breeziness of the user experience. We always try to build modular websites. Modular, in this case, means thinking of website content as discrete chunks instead of web pages. By developing the CMS modularly, website managers update content once and it’s instantly updated everywhere. This is known as C.O.P.E.—aka, Change Once, Publish Everywhere. For example, we used global variables so that AANP can update its membership count everywhere it’s mentioned throughout the site on a regular basis. Instead of having to jump from page to page with a new count, they change it in one place. Voila. C.O.P.E. in action! AANP is an outstanding organization. They support the people who support millions of patients in every corner of the country. And by supporting the entire profession of nurse practitioner—from education to legislative advocacy to professional development—AANP is ensuring that more people will access the patient-focused health care that NPs provide best. It was our supreme honor to partner with the American Association of Nurse Practitioners.